TOXIC BLACK MOLD: JUST HOW SERIOUS A THREAT IS IT? Are you at risk for the symptoms that arise from exposure to black mold toxins? Is your family? The reality is that any home (or workplace) can be a breeding ground for toxic black mold—all it take is the right conditions for the mold spores to grow. Mold spores are virtually omnipresent. There is a good chance you have them in your home (or place of business) right now. But unless conditions are ripe for them to grow, they’ll remain dormant, not bothering anyone. It’s when dampness sets in, however, that mold spores proliferate. Dampness can creep into your house in any of a number of ways. One is in the wake of a flood that encroaches into your house, be it from the weather or from a mishap in your home. One such mishap would be if your water heater pipe broke and your home was flooded as a result. Similarly, broken pipes or hoses connected to dishwashers, clothes washers, sinks, drains, tubs and showers, and toilets can flood your home. An event occurring outside your house—a river, canal, or other waterway overflowing its banks—can flood your home. Storm surge connected with a hurricane is another culprit, as is flooding rainwater from a hurricane or other severe rainstorm. But it doesn’t take flooding to produce damp conditions. In a humid climate, such as in subtropical South Florida, everyday weather and the humidity it brings is all that’s required to create damp conditions inside a house unless you make good use of your air conditioner. Homes without air conditioning, homes where the resident mistakenly tries to save money by not running the air conditioning even when the weather is muggy, and homes where the air conditioning is broken (or where the air conditioning isn’t running because storms or other mishaps have caused the electricity to fail) are all prime candidates for mold growth. 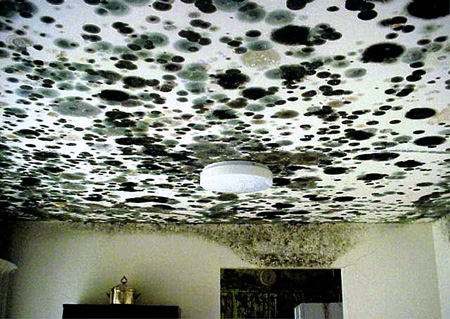 Thankfully, most black mold symptoms aren’t permanent. But take note of that “most.” The statement about lack of permanence isn’t blanket dismissal. If the mold has been cleared from your home (or business), most of your symptoms (and those of the other members of your household or business) should gradually clear up. But I did say “most.” Your immune system, for example, won’t be as sturdy as before, and you’ll be more likely to react to mold and its mycotoxins if you’re exposed to them again in the future.